Paul Castellani will sign copies and discuss Sputnik Summer at the Glens Falls Chronicle Autumn Book Fair at the Queensbury Hotel, Glens Falls, NY on Sunday November 6, 2016 from 11:00 AM to 3:00 PM. Paul Castellani will sign copies and discuss Sputnik Summer at The Adirondack Reader – Inlet, New York on Saturday, July 9, 2016 from 11:00 – 2:00 PM. Paul Castellani will sign copies and discuss Sputnik Summer at the Bethlehem NY Public Library Local Authors Fair on Sunday April 10, 2016 from 1:00 – 4:00 PM. Paul Castellani will sign copies and discuss Sputnik Summer at the Clifton Park/Malta Public Library Local Authors Fair NY on Saturday November 14, 2015 from 11:00 AM to 3:00 PM. Paul Castellani will sign copies and discuss Sputnik Summer at the Glens Falls Chronicle Autumn Book Fair at the Queensbury Hotel, Glens Falls, NY on Sunday November 8, 2015 from 11:00 AM to 3:00 PM. Paul Castellani will lead a discussion of Sputnik Summer at the Bethlehem Area Y Book Club on February 25, 2015 at 1:00 PM. Paul Castellani will sign copies of Sputnik Summer at the Glens Falls Chronicle Autumn Book Fair at the Queensbury Hotel, Glens Falls, NY on Sunday November 5 from 11:00 AM to 5:00 PM. 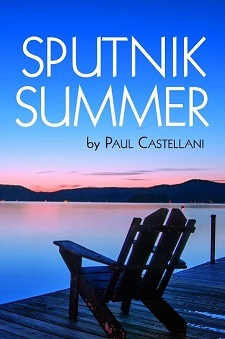 Paul Castellani will read and sign copies of Sputnik Summer at the Northshire Bookstore, 424 Broadway, Saratoga Springs, New York on Thursday, June 5 at 7:00 PM. Paul Castellani will sign copies of Sputnik Summer at the Book House of Stuyvesant Plaza, 1475 Western Avenue, Albany, NY on Saturday May 31 from 3:00 to 5:00 PM. Paul Castellani will sign copies of Sputnik Summer at Market Block Books, 290 River St., Troy, New York on Saturday, May 31 from 11:00 to 1:00 PM. Paul Castellani will discuss Sputnik Summer and sign books at the Bethlehem Public Library, 451 Delaware Avenue, Delmar, New York on Wednesday, May 28 at 7:00 PM. Paul Castellani will discuss Sputnik Summer and sign books at the William K. Sanford Town Library, 629 Shaker Road, Colonie, New York on Tuesday, May 6 at 7:00 PM. Paul Castellani will sign copies of Sputnik Summer at The Open Door Bookstore, 128 Jay Street, Schenectady, New York on Saturday, May 3 from 1:00 to 2:30 PM.